The names used for the Forex market include Foreign exchange market or FX market and it’s basically a market which is over the counter and worldwide, functioning for 6 days per week. Thanks to a number of intermediaries and brokers, there is a huge network which is world wide, so anyone can trade Forex if they wish to. If you’re curious how safe is it to trade Forex, the answer is that it depends on how you do it. If you don’t know what you’re doing and you just start trading, chances are that it’s going to be a nasty experience for you. Being careless and not doing the research will also be dangerous for your finances in the long run. As long as you’re careful and you do everything right, you can make money from Forex trading and it can prove to be a very profitable way to make a living. The person who makes it either safe or dangerous is you. Knowledge means a lot when it comes to trading Forex, so learn as much as possible about the way it works and you should do just fine. Below is a bit of information which should help you trade on the Forex market a bit more safely. The thing to remember is that despite the claims you see from all kinds of brokers and online gurus, Forex trading is not a get rich quick scheme. You can’t just relax and sit back while you’re making money. You have to invest a lot of time into research and there is quite a bit of work to do before you start making a constant profit which will eventually make you rich if you’re good at it. In order to make sure that your money is safe, you should do as much analysis as possible, studying trends and keeping in touch with the latest news. You always have to know how your investments are doing and what can influence them. The base currency when it comes to forex trading is usually a currency which is well known and easy to use. The USD is one such currency which is often used as the base currency in currency exchanges. One example of how Forex works would be an investment of $10 into Euros. Say you get 7 Euro for that $10. You want the European Union economy to do as well as possible so that its currency will grow in value. If it grows in value, you can buy more dollars with it, so for the same 7 Euro you might get $11 or $12 in return. That extra dollar or two would be the profit in this scenario, though the currency fluctuations aren’t usually as big as in this example. When you’re a Forex trader, you need to understand how this process works and when you can invest and when you have to trade your currency. To begin trading Forex, you can look for a broker which can trade in the Forex market. Before you get started, you should look at his authorization, to make sure he has the authority to trade on the market. Besides his authorization, make sure you know exactly what you’re signing and what he’s promising you. Getting a very good broker is the best way to keep your investments safe. When you’re looking to do some safe Forex trading, you need to find some strategies which work for you. Something that works well is pairing up economies. 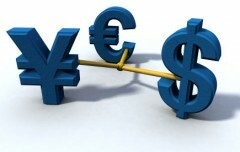 One example is pairing up the Euro with the USD, or the Yen with the USD, or any other combination. Look at the economies of the two countries which issue that currency and analyze their supply and demand. You should also make sure you know how the exchange rate varies between the two countries and their economies. Graphics might just give you a better idea of how that rate evolves and when might be the best time to buy and sell currency. Ideally, you want to buy when the price is low and to sell when it’s high. The basics are the same as with every other type of business, buy low and sell high.